Welcome Back to Gotham City: Trump is His Own Best, and Worst, Crisis Actor. The rest of the White House, realizing this, sought to get in front of Trump's latest self-inflicted wound by shoving Sarah Sanders behind the podium and telling her to tell the media that Trump's tweets were just "opinions." Except, Sean Spicer had something to say about that during his half year of living dangerously when he said Trump's tweets should be regarded as official statements. Because when a public official who serves at the pleasure of the president or, in this case, a Russian stooge like Trump, puts something on an official Twitter feed that's critical of said official, that official is more or less officially being put on notice. Trump attacked Comey on Twitter before firing him. He's attacked Mueller, Sessions and Rosenstein and probably has to be physically restrained from doing the same to them. It's not a mere "opinion." When it comes from Trump or a real president, it's official. From a purely psychological standpoint, it's a comic mini masterpiece. Trump of all people should know Sessions had almost immediately recused himself from anything having to do with the Russian probe. In fact, Trump's been raging about that, even saying he wouldn't've nominated Sessions had he known he would. And in that instance, Trump in essence admitted he installed Sessions not because he was the most fit person to be the top cop. As with everything Trump does, Trump installed Sessions with the blessings of Senate Republicans to benefit him in the short term. In this case, so the little racist from Alabama could spike any investigation in which he was the subject. 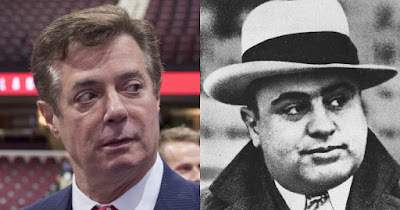 When Eliot Ness was unable to get Capone on murder or any serious criminal charges, he hit him in the one spot Big Al couldn't protect himself- His fat wallet. Capone was tried, convicted and sentenced on tax evasion, a conviction that got him a one way ticket to Alcatraz. So, why did Trump choose to compare his former campaign chairman to a mobster who was convicted for not paying his taxes? Of course, the main difference between Trump and Capone is that we've actually seen Capone's taxes. Donald Trump is like a 72 year-old adolescent girl who cuts herself. When things go wrong in his domestic circle, he cuts himself by creating self inflicted wounds in the form of tweets that in some cases, investigators and judges factor in with their already growing pile of evidence against him. He's already surely committing obstruction of justice every time he screams about the "witch hunt". Regardless of what Sarah Sanders believes or is told to say, Trump's tweets are official public documents, wearisome overuse of the phrases "witch hunt", "17 angry Democrats" "fake news" and all. 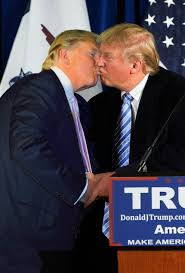 And when Trump directs them at his own Attorney General in relation to a nearly year and a half year-long probe into him and his dealings with Russia, that automatically puts pressure on the nation's top cop, recusal or no. And recusing himself from anything having to do with the Russia probe was the first, and only, decent and correct thing that Sessions has done since taking the job. And don't think for a minute that Mueller and his people aren't cataloguing as evidence every tweet that Trump's fat little thumbs have put out slamming the probe (and there have been plenty). This is not how an innocent man acts. An innocent man would welcome the investigation and the chance to clear his name. He wouldn't be impatiently and angrily demanding the shutting down of the probe, talking about "red lines" and to whom Mueller's team can speak or not speak. Trump publicly flagellates himself whether he intends to or not. He is his own best, and worst, crisis actor.